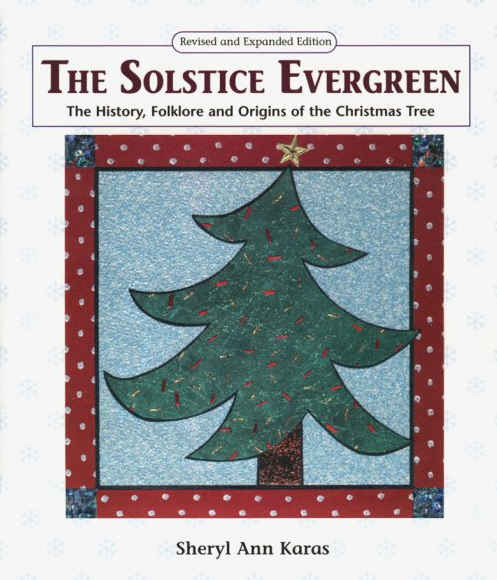 The Solstice Evergreen: The History, Folklore, and Origins of the Christmas Tree , 2nd ed., edited by Sheryl Ann Karas (Aslan, 1998). The old woman sat stiff and still in a wheelchair, alone in the crowded exhibit hall. It was the opening day of the Festival of Trees. The woman’s face was severe and leathery — a mask of fine wrinkles and liver spots. Her hair was sparse and yellowing. It was held together in a tight bun at her neck. There was a warm-looking mohair shawl about her shoulders and another one covering her lap. She appeared to be very frail, but she had the air of someone who had been important in her time. Her clothes looked expensive. Her wrinkles were expertly covered by makeup. Perhaps she once organized the Festival of Trees. A retired general, reviewing the troops from the sidelines now, but no less dignified than when she led the charge. Someone had positioned the woman’s wheelchair near the entrance of the big auditorium at the back of the institute. The room contained several decorated Christmas trees, a display of exquisitely detailed gingerbread houses, and a stage where singers and musicians performed at intervals. The old woman had chosen her spot with a purpose it seemed. She was next to a tree that had “touch me, please” printed on a sign at its base. It was the only one offering itself to inquiring hands. This “touch me” tree was decorated for children and ringed with colored lights in the shape and colors of Crayola crayons. The branches held caramel popcorn balls, brightly colored alphabet blocks, wire bicycles with spinning wheels, boy and girl gingerbread people, and small Raggedy Ann and Andy dolls holding out real chocolate kisses to those who came to stare. There were also birds — blue, green, yellow, and red — perched with outspread, feathery wings on branches all over the tree. If anyone touched one of these birds, it would sing a high, trilly, real-sounding birdsong. If you touched them all, one right after the other, the whole tree seemed to be singing. The old woman sitting next to the “touch me” tree appeared to be asleep. Her head had fallen forward and her eyes were closed. It looked like she hadn’t moved for a century or more. The fuzzy mohair might have been cobwebs spun over years of stillness. In fact, so still was she that the youngest of children could stand right next to her, gazing at the tree, with no sign of fear or self-consciousness. But when a child touched a bird and made it sing, the old woman came to life, suddenly a Snow White responding to the magic kiss. Her head would rise from her chest and she’d smile at the lucky one who brought such music to the world. It was a breathtaking, transforming smile — one in which every wrinkle participated. Her face lightened and all her features rose, gaily defying gravity as they showed her delight. The receiver of such a smile had no choice but to smile back, and so the old woman usually got back as good as she gave. A little girl of four or five entered the hall with her mother. She spotted the “touch me” tree at once. She’d been searching for it. She knew that this tree was for her. It had been very hard not touching all the pretty things on all the other trees they’d seen. The volunteer ladies had eyed them warily like stern grandmothers always hovering, watching, shaking their heads. Now the child pulled on her mother’s arm, straining to reach her tree. As they’d remembered from last year, it was near the entrance of the hall. When she saw the tree, she dropped her mother’s hand and stood, filling her eyes with beautiful colors and shapes, and her nose with the scent of gingerbread and pine. Then she touched everything! She spun the ornaments that would spin and lit the ones that would light. Encouraged by one of the now-smiling grandmas, she even took a chocolate kiss from a Raggedy Ann’s gloved hands. When she discovered how to make the birds sing, she quickly stroked every bird within her reach. She worked her way around the tree, singing with the birds, until she was ambushed by the old woman and her smile. The little girl stared at the woman for the length of time it takes to fall in love. Then she walked up to her. “Do you want to touch the birds and make them sing?” she asked. The old woman’s eyes never left the child’s face. The two might have been alone with the bird-filled Christmas tree. The girl’s mother stood to one side and watched, without interfering, as the woman nodded and whispered, “Yes.” The child picked up the bent and bony hand from the woman’s lap and carried it in both of hers, gently, as though it were something precious that might shatter if treated roughly. She placed the hand on a red bird’s beak and laughed when it chirped into song. Then she moved the hand to another branch and then another after that. The old woman’s smile, fed by the laughter of the child, grew so wide and light and air-filled that it seemed to lift her whole body right up out of her chair. The two of them danced to the birdsong, whirling and laughing among the beautiful trees, free of everything that had previously held them earthbound. When the birds finished their singing, the little girl gently returned the old woman’s hand to her lap where the woman cradled the child’s small, smooth one for just one wistful moment longer. Suddenly the girl announced, “I’ve got to go see the gingerbread houses now.” She skipped away in the direction of the display tables. Over her shoulder she called to her new friend, “Maybe you can play with me tomorrow when I wake up.” The old woman watched as the girl’s mother lifted her, the better to see the candy highlights embedded in the gingerbread castles and cottages. Before she closed her eyes once more, the old woman had a sweet thought: “Wouldn’t it be nice to play again tomorrow?” She slept and dreamed of tiny hands and the singing of birds.